Susan Mitchell, founder and president of the Nature Coast Friends of Blues found out she has ALS – Lou Gehrig’s disease in June 2012. This affliction, or as her husband Keith affectionately describes it, with a southern accent, “Mama’s Delicate Condition” has taken over her life and leaves little time to concentrate on the organization. At the end of May, she stepped down as president handing over the reins to Jim (Boe) Anderson who started Blues’n Bar-B-Que way back in 1995. His good friend Gale Wire also stepped forward to help and our remaining board members have stepped forward to aid with the transition. They include Vice President Jim Priesmeyer, Secretary Ronnie Wayrich, Treasurer Otis Brown, and board members Jim Davis, Linda Myers, and Sandi Meyer. Susan will be available to counsel the board when needed, but she certainly misses being out in the community fundraising and putting the message out about our events. Citrus County has been supportive over the years and Susan hopes they will continue to support our efforts as we nurture Citrus County children’s interest in music. LECANTO--The Nature Coast Friends of Blues Inc. recently donated $1250 to benefit children served by Hospice of Citrus County through its “Camp Good Hope” and “Teen Encounter” camps for those who have experienced the loss of a loved one or friend. Camp Good Hope and Teen Encounter are supported solely through community donations, corporate sponsorships and grants. Nature Coast Friends of Blues Inc., raised the money from proceeds from the recent “Blues n Bar-B-Que” held on Saturday, November 5 at the Museum Café located on Yulee Drive in Old Homosassa. Pictured are (from left) Nature Coast Friends of Blues Board Member Jim Davis, Board Member Linda Myers, Board Member Sandi Meyer, Nature Coast Friends of Blues President Susan Mitchell, Hospice of Citrus County Development Director Linda Baker and Hospice of Citrus County Director of Pediatric Services Marylin Bloom. On Wednesday February 3, 2011 NCFB President Susan Mitchell met with Linda Baker at Hospice of Citrus County in Lecanto. There she announced that their camps named “Camp Good Hope” and “Teen Encounter” is the 2011 beneficiary of the 2011 Blues’n Bar-B-Que. “Camp Good Hope” deals with children ages 6 – 12 and “Teen Encounter” deals with those aged 13 – 18. Many children go through the grief of losing a loving family member or friend and need help dealing with that grief. 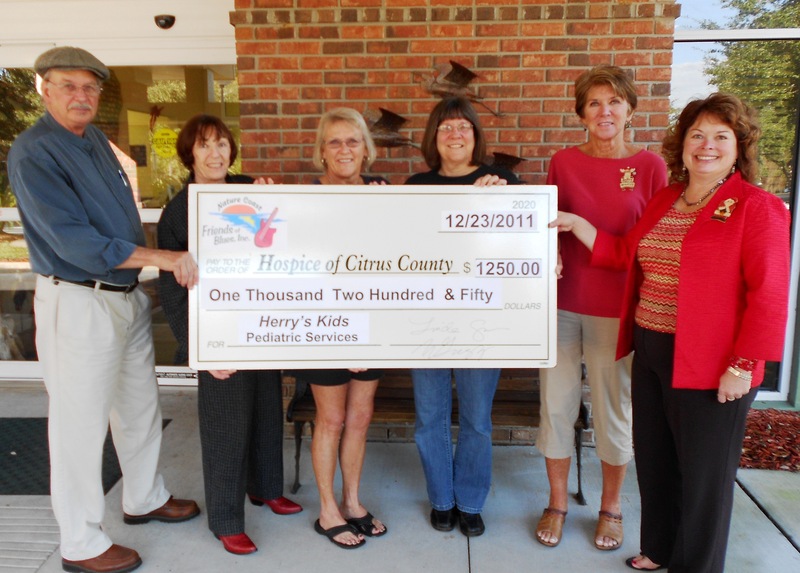 If you know of a child who could benefit from this camp please contact Citrus County Hospice at 352-527-2020. These camps are free to those attending. The camps are held at Camp Good Counsel on Gobbler Drive in Floral City and the next camp is Friday and Saturday April 15th and 16th. We are members of The Blues Foundation. Our relationship with this international blues giant will help us grow over the coming years into a stronger more active blues organization. Please visit their site to learn more.